If you have been searching to find a dependable roofing contractor to do your next commercial roof, Great Lakes Commercial Roofing is the right company for you. We have a team of top quality roofers that are factory trained, certified, licensed, and experienced. We want only the best for you and that is what you will get over and over. We make certain that we know all commercial roofing methods so that you consistently have what you want. We provide commercial roofing only, so that we are able to go beyond in that field. We value and take so much pride in how we do customer service and the quality of roofing we give. In order for us to always be there for you, we provide 24/7 services. We are there for you in 24 hours if there is ever an issue with a roof that we have worked on. When you have an issue with your roof, we get it taken care of quickly. If you want a quality commercial roof, phone us at 412-256-8050. Flat Roof Coatings A flat roof has to have a lot of care compared to a normal roof and is smart to think about putting a roof coating on it to protect from water damage. 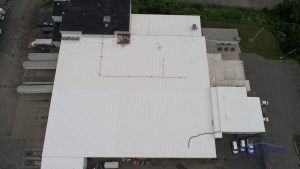 Industrial Roof Coatings You pay a lot to place an industrial roof on, make sure that it is protected correctly and will keep your roof safe with a roof coating. Urethane Modified Acrylic Putting a urethane modified roof coating on your roof will allow you to keep your roof lasting on your commercial building for a long time. One of the top decisions you could make is to place a roof coating onto your roof. Adding a roof coating will keep your roof lasting longer than even before. If you need a roof coating, we offer them for any kind that you want like rubber, industrial, and flat roofing. If you want to add an additional 10 years of life to your roof, consider looking at the varying kinds of roof coatings. At Great Lakes Commercial Roofing, we work above and beyond to remain up to date and learn all of the latest and top techniques for you on roofing. The best thing about roof coatings is that they are typically easy to have installed and don’t take much time at all. While our roofing contractors are doing their work, they will always be courteous and respectful. When you have questions about a roof coating in Ben Avon, PA, phone us at 412-256-8050. Keep in mind that we also have free estimates as well. 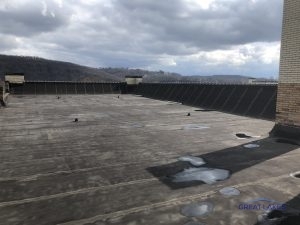 Commercial Roof Repair When you want a commercial roof repair, it is important that you have an expert out to do it right away. Cool Reflective Roofs A cool roof is a great option to save energy by just including a new roof to your commercial building. Green Roofing A green roof is a solid option when you want to lower your heating and cooling bill while additionally having a roof that is good for the environment. Commercial Roof Installation With a team of trained experts, your commercial roof will be worked on quickly. Commercial Foam Roofing Foam roofing has simple installation and when it is finished it is completely seamless so it is water safe. 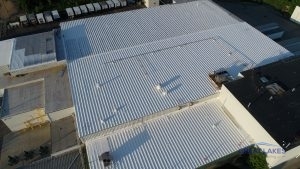 Commercial Metal Roofing When you need a roof that can offer you protection for over 70 years, this is the roof you need. Commercial Roof Consultant We have professionals that will help you through the entire roofing process and be available to explain it all to you. A really solid roofing system that is dependable, is a PVC roof. Although there are pros and cons to each material you have, PVC roofing is a top quality product that can stand the test of time. This roof can potentially last up to 50 years depending on the weather. It is put on your roof by being rolled out and looks like a sheet. This is a great choice because it keeps your roof protected from fires, is moisture protected, and is sturdy through most weather. There are many more reasons, but because of those and it being so economical, it has become extremely common. Single Ply Roofing Single ply roofing is a top option to put on your commercial roof and keep it safe. TPO Membrane A TPO roofing membrane is able to keep your roof safe with its rubber base and can also reflect the sun off of it, keeping it cooler. A great option that you can make is to get your roof restored instead of replacing it. Roofs can become worn down everywhere or heavily in certain spots. We are able to determine if you will need to replace your roof or if you are able to restore it. When you call us, we will send someone out to decide if the roof can be restored or not. This process is a lot cheaper and is good for the environment as well. When you have your roof removed, it is adding pollution the earth and is adding to landfills. A roof restoration will let you to keep your roofing system and make it be new again. 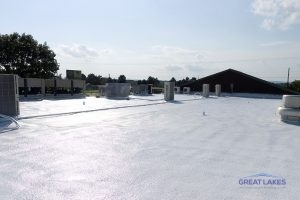 Silicone Roof Placing a silicone roof on your commercial building can keep it safe and allow it to last for a long time. Acrylic Roof An acrylic roof can keep your roof safe from water damage and make a seamless look. Elastomeric Roof The strength of this roofing system is great and will be able to resist things like cracking and tearing while also keeping away the suns harsh rays. Putting a metal roof on your commercial building is a great option of roofing system. Just like with any roofing system, you will need to do regular maintenance in order to have it working as long as possible. 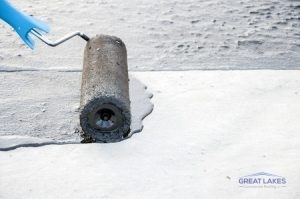 Putting on a roof coating is a good decision and will keep it protected. By adding a coating to your metal roofing system, you are going to protect it from water damage. If you get water damage, it will rust and eat away at the metal roofing. 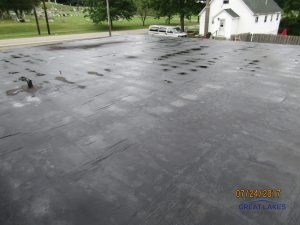 A roof coating will add 10 additional years of life to your roof and keep away rust and water damage. For a deal that cannot be beat by anything else, a roof coating is a solid way to go. Flat roofs have the problem of getting water that stays on it. That is a big thing you will need to pay attention to because otherwise your flat roof could get damaged. Spray foam creates a seal and renders the roof completely waterproof. Spray foam roofing is the only roofing that has no seams so it becomes completely waterproof. It is definitely strong enough for you to walk on so that you still have access to your roof. Our professionals build up the roofing in certain parts so that water does not accumulate. If you want spray foam roofing in Ben Avon, PA, dial 412-256-8050.